re-development of a new theatre work 'The Divination Agency' performed at the State Theatre of WA. In 2015 I performed in 'Ngalyak and the Flood' a new intercultural dance/puppetry work at the International Puppetry Festival of Charleville-Meziers, France for Big Mamma Productions. I have toured internationally with the Snuff Puppets, performed and puppeteered for Lyric Opera, Museum Victoria and independent theatre companies. In 2015 I co-founded 'The Divination Agency' with Kat Taylor, an interactive public performance involving dictionary divinations created using paint and a typewriter. 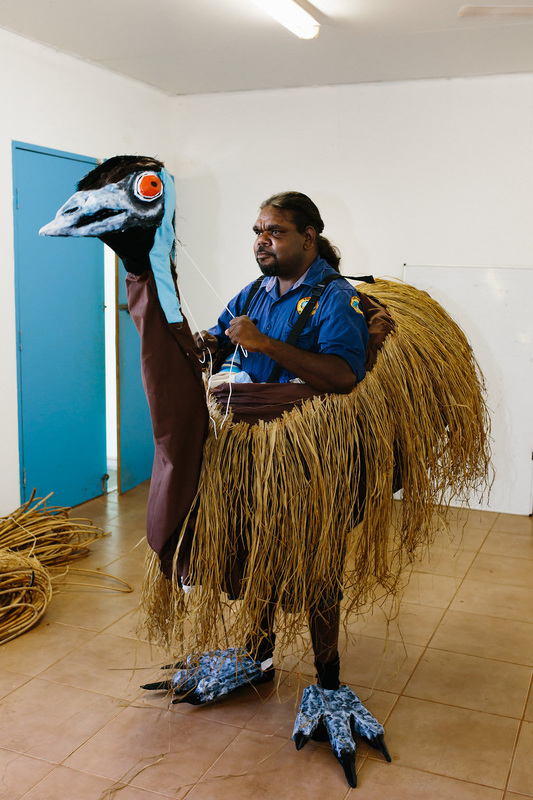 Over a series of community workshops in Broome, the giant pandanus, frilled neck lizerd, gouldian finch and pelican were created. They celebrate the amazing lifeforms of the Dampier Peninsula in the Kimbelery. They made their debut in 2013 with the Broome Dreamtime Dancers and then at the Shinju Matsuri Festival on the streets of Broome, accompanied by a the Jila Junk Band. Miss Print and Ms Divine present "The Divination Agency" . Armed with a mystical dictionary, brushes, a typewriter and lots of ink, The Divination Agency brings a corner of magical chaos to festivals and stages across Australia. Explore your present or future through images or the typed word. Part homage to Ms Divine’s spiritualist grandmother, the Agency is narrative therapy meets the occult whilst irreverently pawing at the English language. "Once upon a time there was a collector…she would gather up stories and create worlds in her head….of places she‘d never been, people she‘d never seen, or maybe would never see again. Sometimes these stories were the barest fragments, and when they were knitted together there were holes which the collector filled with imaginings"